New parents are almost always overwhelmed with the onslaught of emotions that come from the birth of a new child. Take the time to send them a word of encouragement and congratulations. They will appreciate your kind words during such an exciting time for them. Write a short message on a card, wish the lucky parents on Facebook or send them an email. The following cuddly, cute and drool worthy congratulation messages and wishes are perfect examples of what to say to the people you love who just welcomed home their new child. A child is a precious gift that fills the heart with a joy you never knew you were capable of feeling. Take this time to relish in the miracle of your new family. We wish you many, many happy years as your child grows into a beautiful little person. There is nothing more exciting than the birth of a child. We know you have many sleepless nights ahead of you, but it will be worth it in the end. Congratulations on the new baby! We remember what it was like to hold you in our arms as an infant. Now, you have a baby of your own. Welcome to parenthood, son/ daughter! Can you believe how quickly those 9 months passed? I hate to tell you, but the next 18 years will go by just as quickly. Take the time to enjoy every little moment. Congrats n your new baby. Congratulations on your new role as parents! This will be the hardest, but most rewarding job you have ever had before. This might not be your first child, but the feeling of joy and love is the same. Congrats on the new addition to the family. 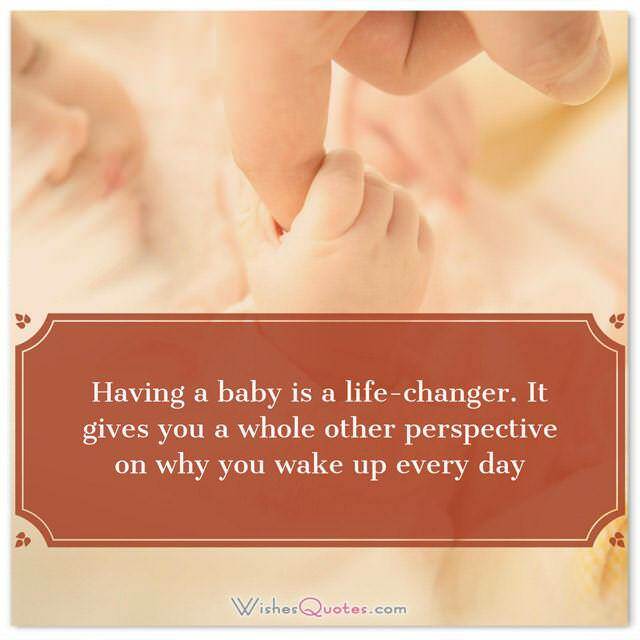 There is no greater joy than the birth of your child. We hope you relish in this moment and enjoy your new family to the fullest. There is nothing we can say that will show how much we love you and your new baby. We cannot wait to meet him/ her! This is such a marvelous time. Congratulations! our baby looks absolutely adorable. I cannot wait to watch them grow up with everyone we love by their side. Congrats! The new baby will be the center of your attention forever more. This is a new life that is both scary and exciting. However, you will be an incredible parent. Congratulations. All you ever imagined will come true with the hopes and dreams you have for your new child. Congratulations on the most magical time in your life. Can you believe how grown up we are? I remember when we were just in high school. Now, you have your own child! I am so proud and excited for this new phase in your life. Here is pack of diapers and some wine for you! It was a long 9 months, but you can finally have a drink to celebrate! Happy mom and dad forever! Congratulations on the birth of your child! There is nothing better than the smell of a newborn baby. I just love their little feet too! Remember when they are small because they grow up so fast. You might not be able to be as spontaneous with a new baby, but you will not want it any other way. The time you spend with your precious family if what you will love the most. Congrats on your new child. We love your kids, and we cannot wait to meet the newest member of the (last name) clan because we are going to love them just as much. We know you are so excited, but take the time to rest because you have some sleepless nights ahead of you! Congratulations on your new baby.